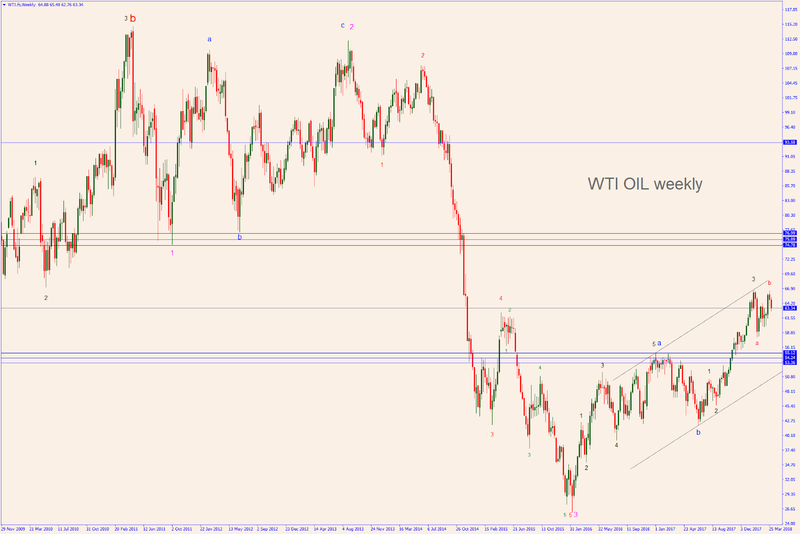 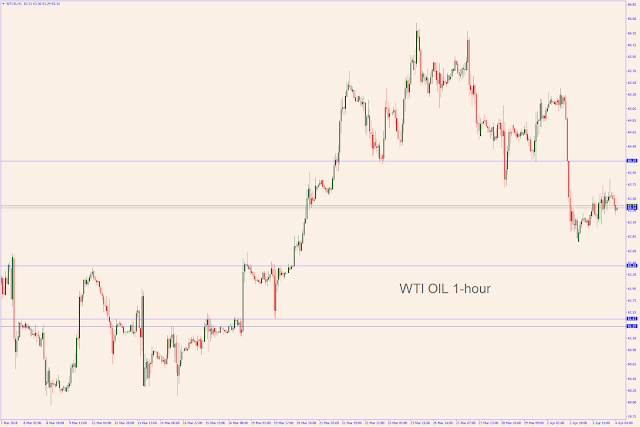 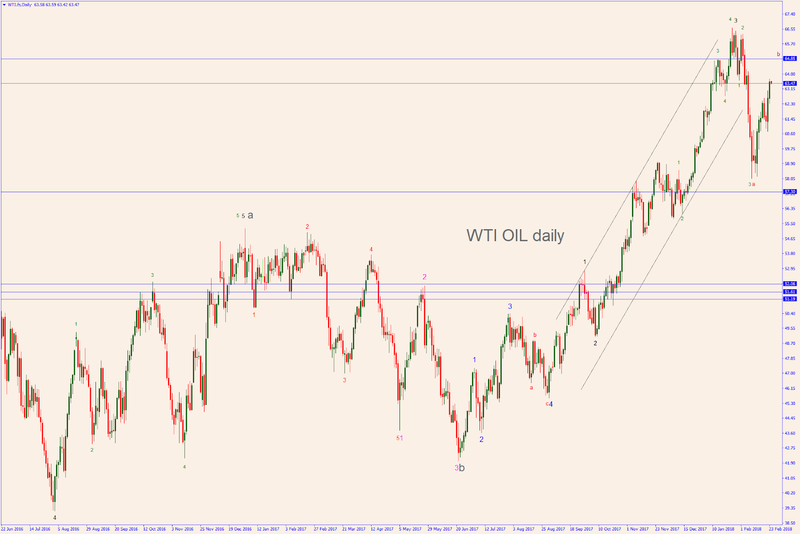 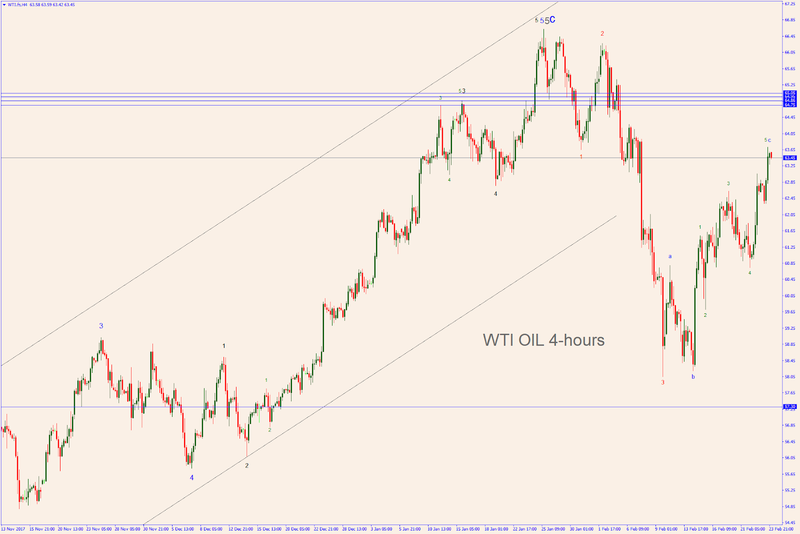 WTI OIL to top soon? 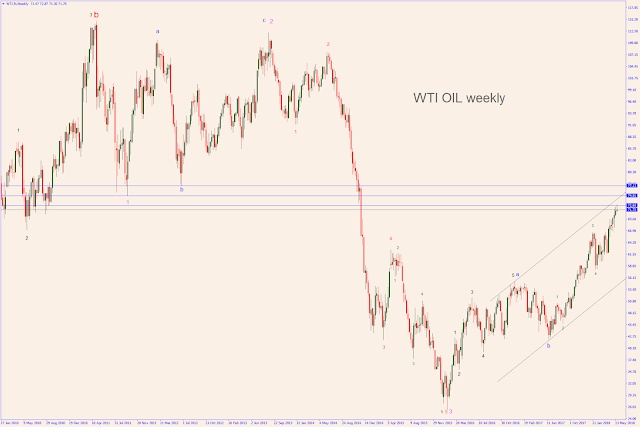 The weekly chart shows the giant a-b-c started in Feb 2016 where wave-c is almost completed. Wave-a and wave-b are fully deployed whilst wave-c is in the very final stage. The monthly chart shows that this giant a-b-c is just a retracement wave up (wave four) of the downturn that started in July 2008. Once completed, it will stage an important correction to the South side. As for the daily chart, it displays a 1-2-3-4 (in black). 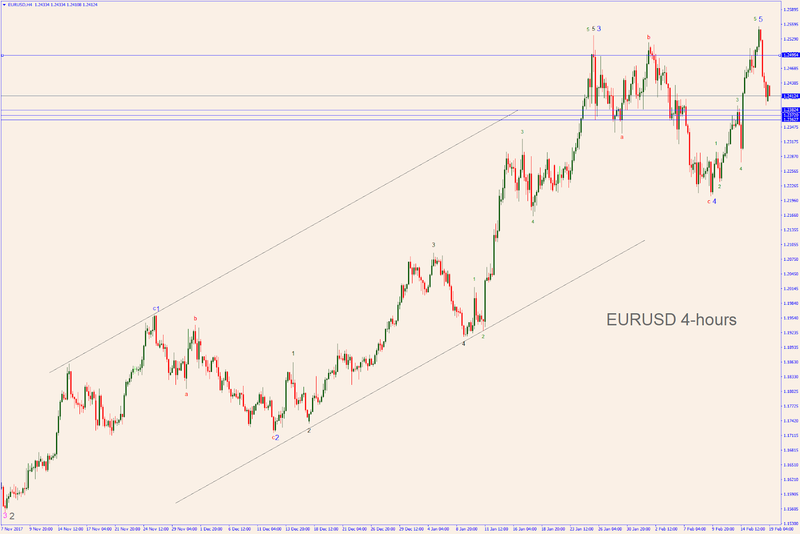 After that another 1-2-3-4 (in green) highlights four waves of a smaller degree. Once wave five is completed, the whole pattern could reverse course. Finally, check the arrow in the 4-hours chart: it highlights a candlestick pattern that usually occurs when a top is imminent. I am grinning as I got it right again. 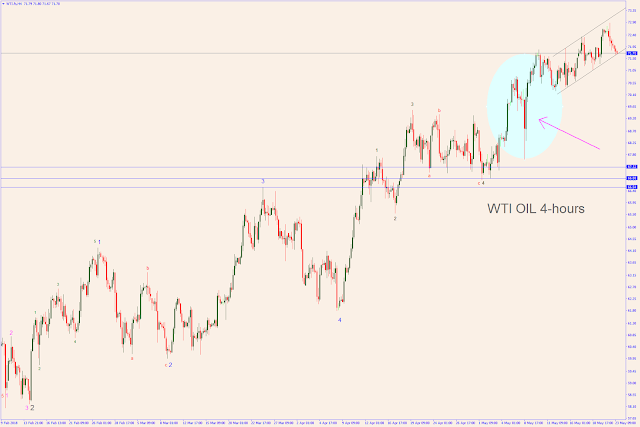 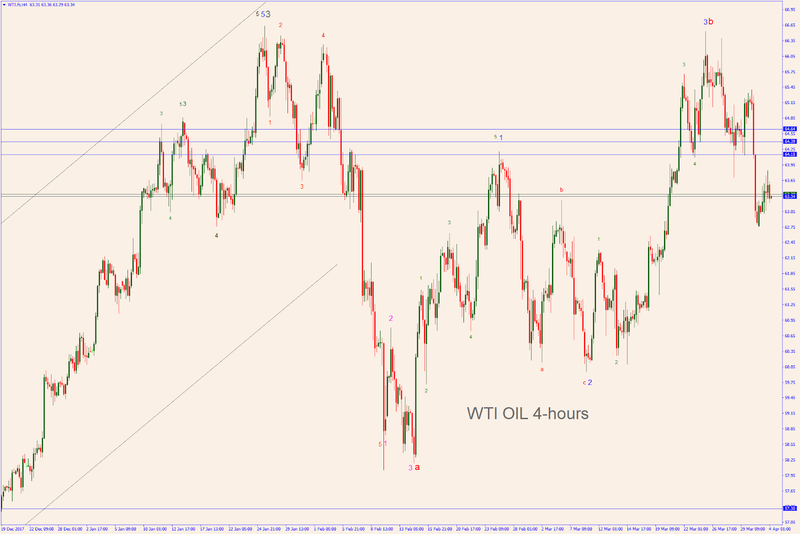 At present, the WTI OIL (now at 63.35) seems to be heading towards the 57.30 area as it's performing a retracement wave (see my previous post). 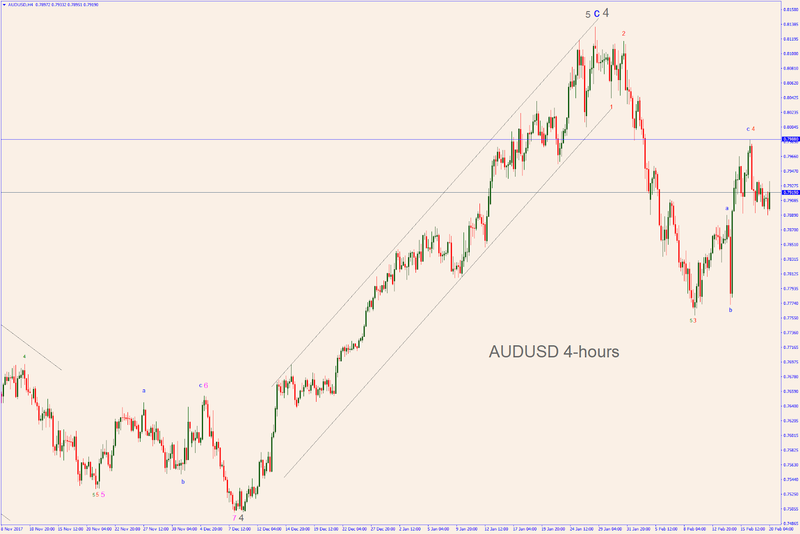 However, there is still a chance for a small jump to the area 64.15-64.64 before heading South. 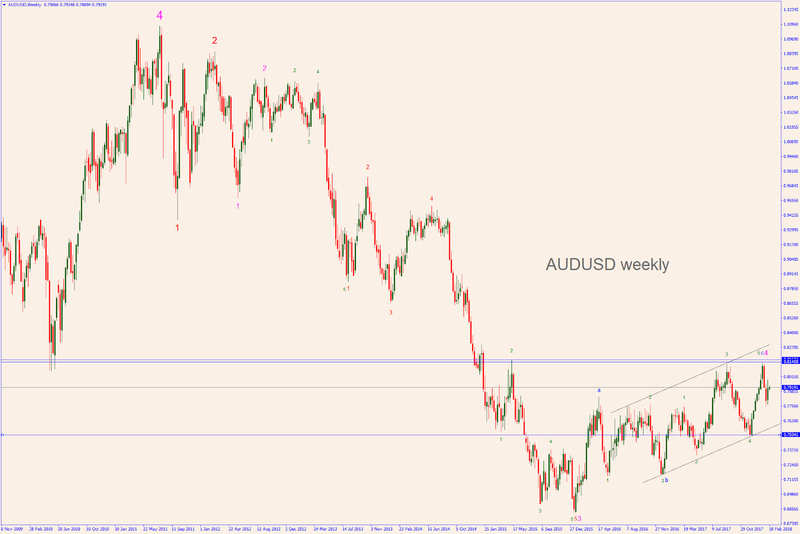 The weekly chart shows the giant a-b-c started in Feb 2016 where wave-c is in the making. Wave-a and wave-b are fully deployed whilst wave-c is still in the making. It could end in the 69.6-70.50 area or even the 74-77 area. 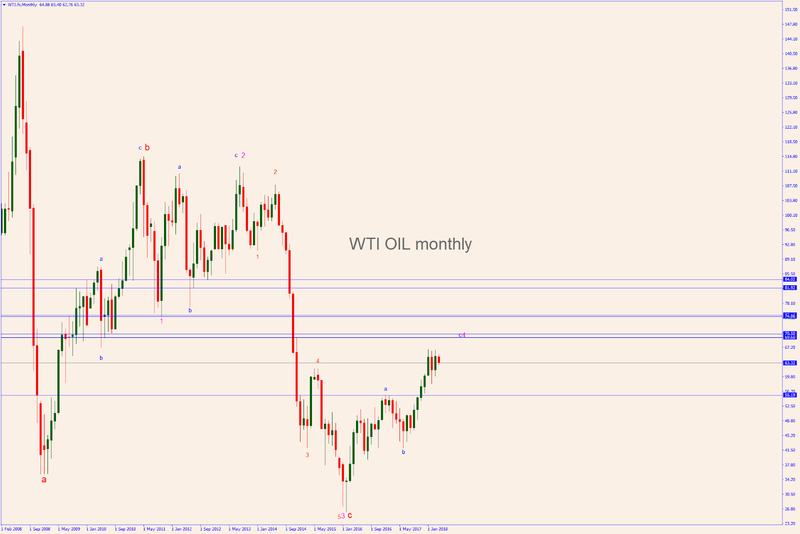 The monthly chart shows that this should be the last retracement wave (up) before the final dive (wave-5). As for the daily chart, another smaller wave-4 is unfolding with an a-b-c on a much smaller scale. 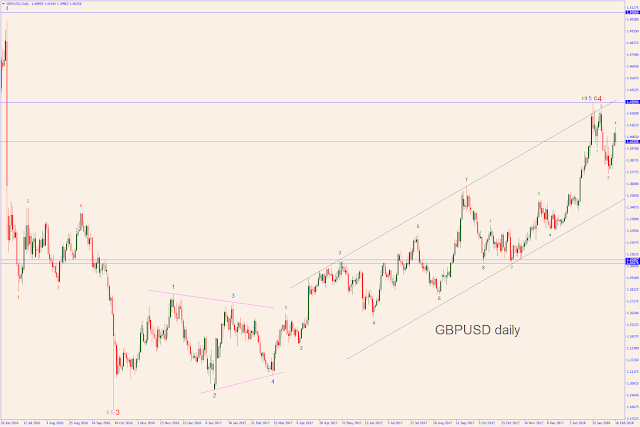 Wave-a and wave-b are already in place whilst wave-c is still in the making with a possible target down to 57.30. 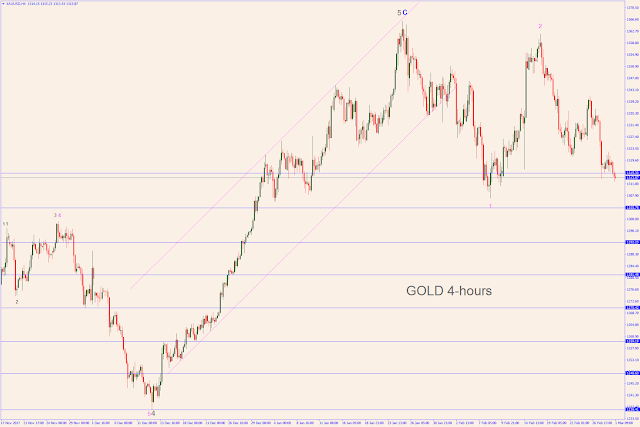 The 4-hours chart shows the target area of the possible rebound: 64.15-64.64 within the next few hours, whilst the 1-hour chart draws our attention to a possible intermediate target at 61.30-61.45. 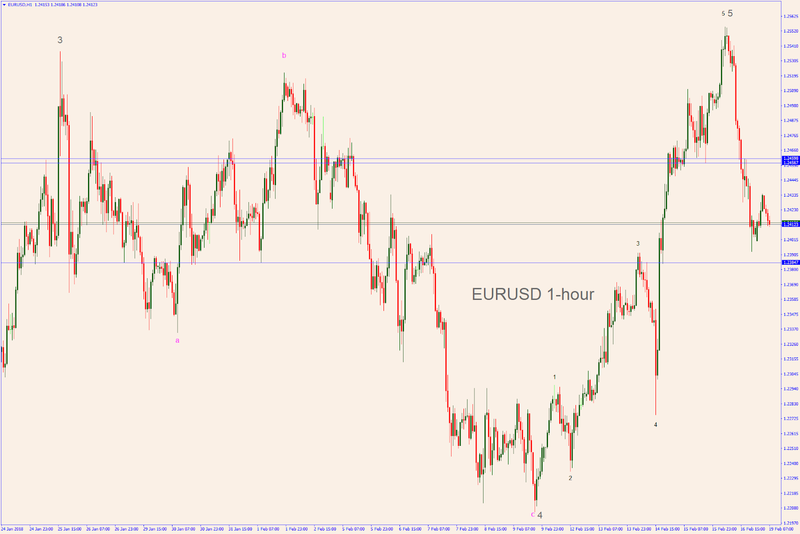 Time to short the Euro? As I said in my previous newsletter, the Euro bounced back a bit and then resumed the downtrend, probably to the 1.20-1.18 area and below. 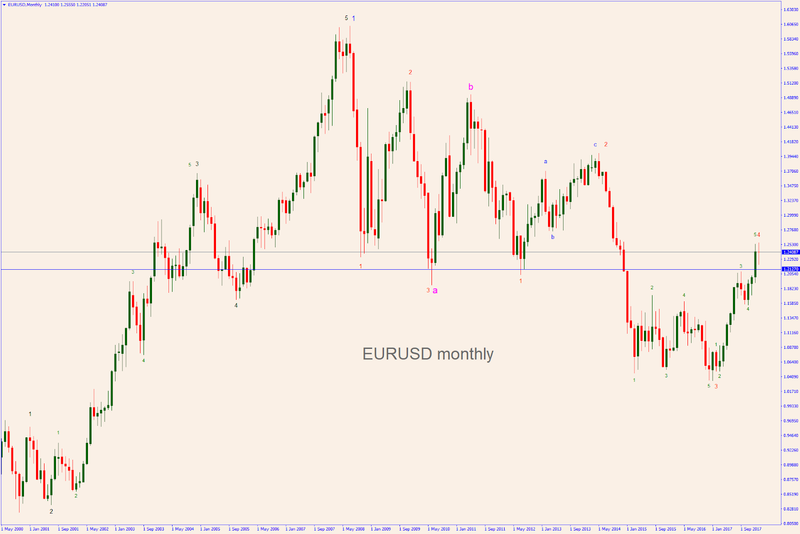 The monthly chart reveals that the Euro is unfolding a huge a-b-c retracement wave (since July 2008) where the last leg (wave-c) is supposed to be made out of 5 large waves down. 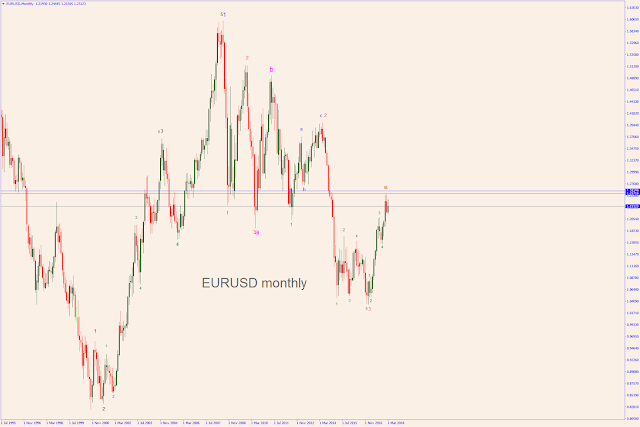 Four of these five waves can be observed in their entirety on the monthly and weekly charts. Their deployment is complete. Conversely, the formation of the fifth wave down has just begun, as you can see in the daily and 4-hours charts. 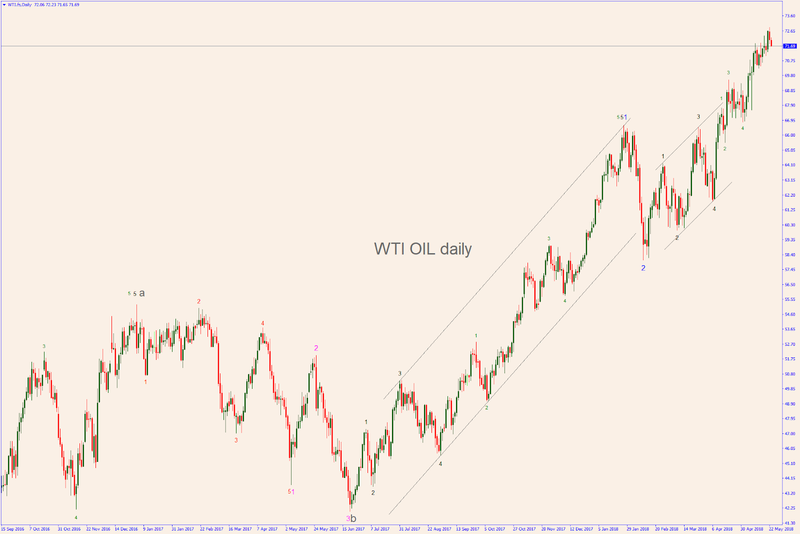 Besides, the weekly and daily charts display clearly the large a-b-c that formed wave-4, which in turn, is one of the large five waves above mentioned. 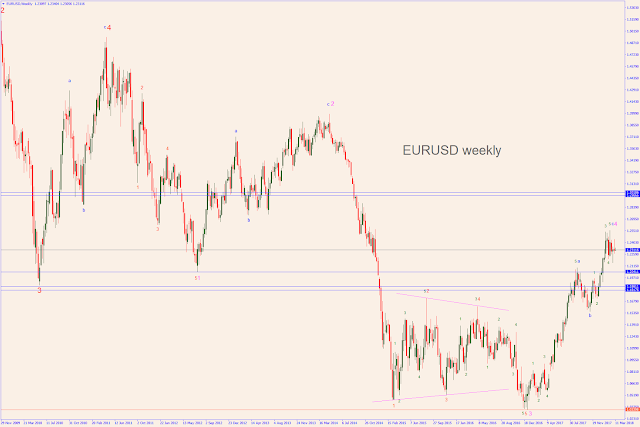 Given the particular pattern, the Euro might take a sharp dive well below 1.20-1.18. 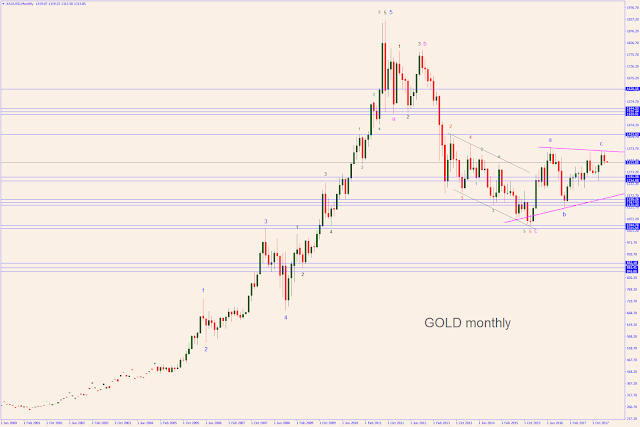 Even the stones on the ground noticed that GOLD (now at 1313) is inversely correlated to Bitcoin. When Gold topped at 1366 at the end of January, Bitcoin bottomed at 6,981 at the very beginning of February. Now that Bitcoin is moving up again (now at 10,427), Gold shows extreme weakness and it started a journey that should take it to 1301 and to the area 1251-1234 for a start. 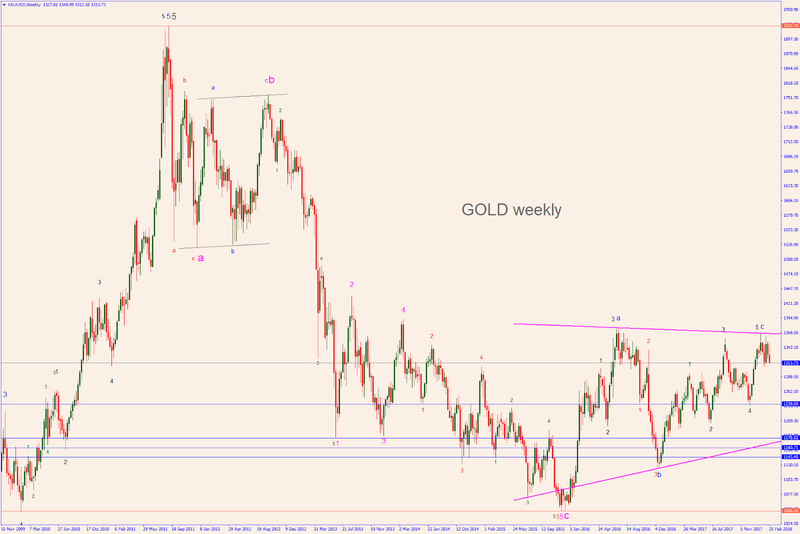 Although the XAUUSD is supposed to bounce back to 1330, overall it looks extremely bearish - see the daily chart - and might not be able to find a serious support before hitting 1239 or even the area 1178-1143 (see the weekly chart). The identification of the Elliott Waves often poses some real challenges when it comes to some complex waves labelled by the purists "wyz-x-wyz". For the time being, I prefer to avoid that fancy stuff and stick to the hypothesis of a wedge formation - see the weekly chart - that might require another low around 1200. 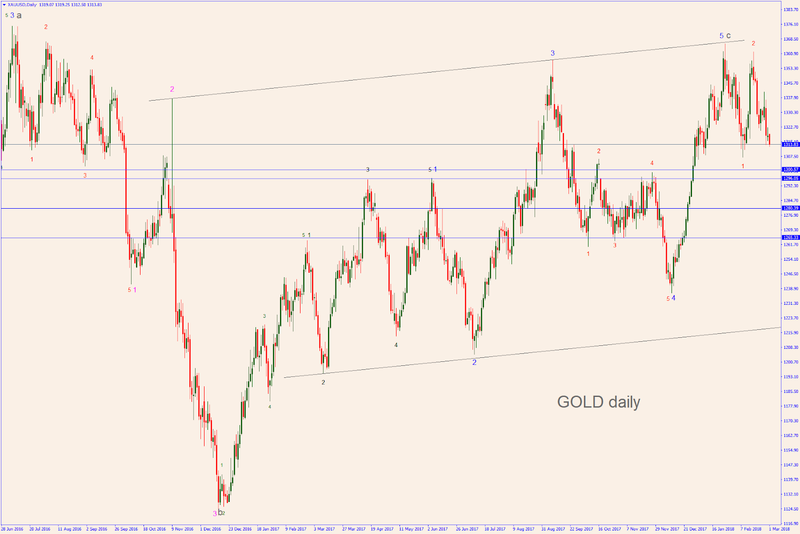 However, just bear in mind that, in the very long run, this kind of pattern has the potential to drag the yellow metal down to the area 882-845. 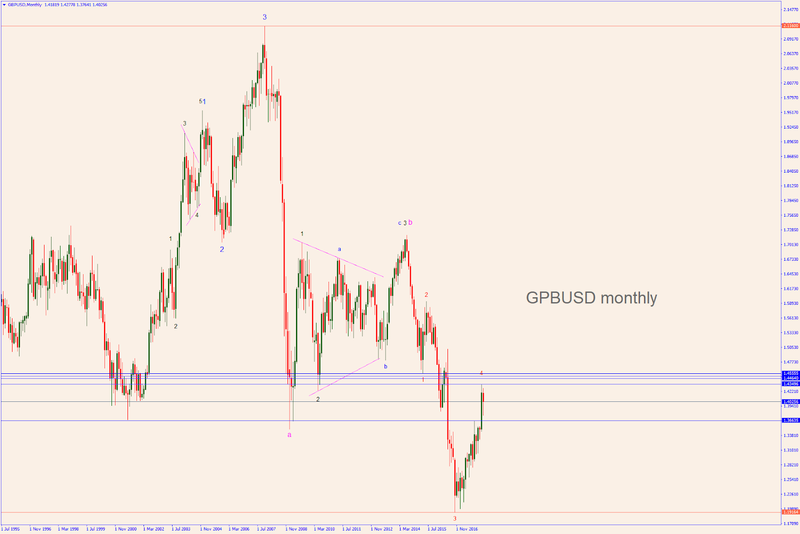 See the targets in the monthly chart. The WTI OIL (now at $63.40) might top around 64.75-65.05 and temporarily reverse to the 57-55 area. On the monthly chart, check the last red candlestick: it looks like an inverted hammer. 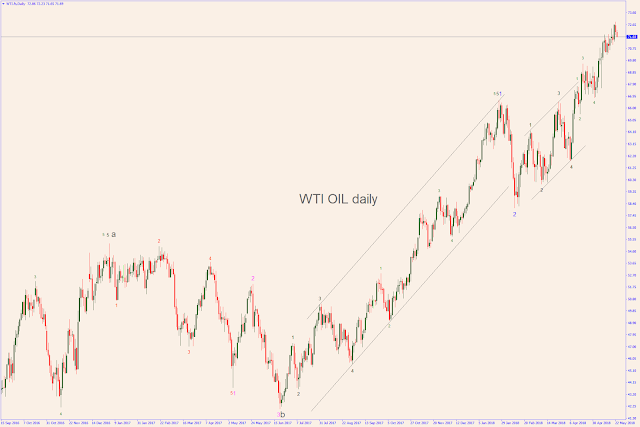 This typical candle appears during the making of wave-4, which is the last retracement wave before the final rally (wave-5). 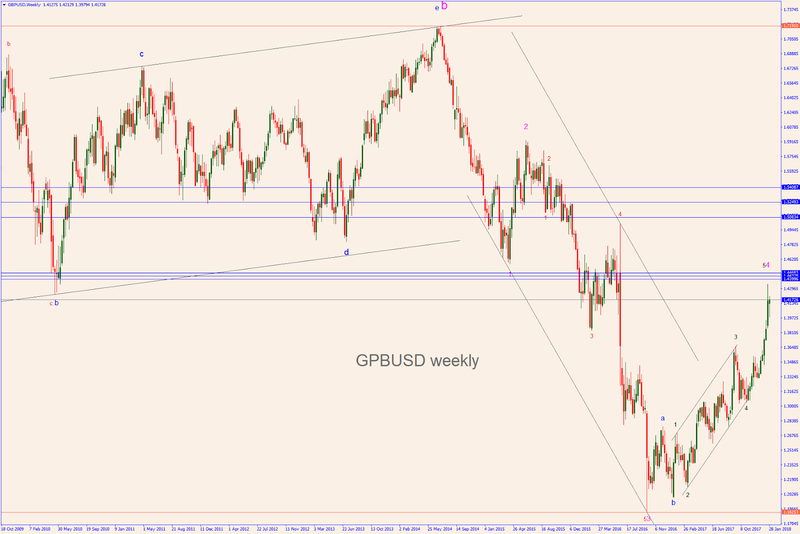 The weekly chart shows the giant a-b-c started in Feb 2016. 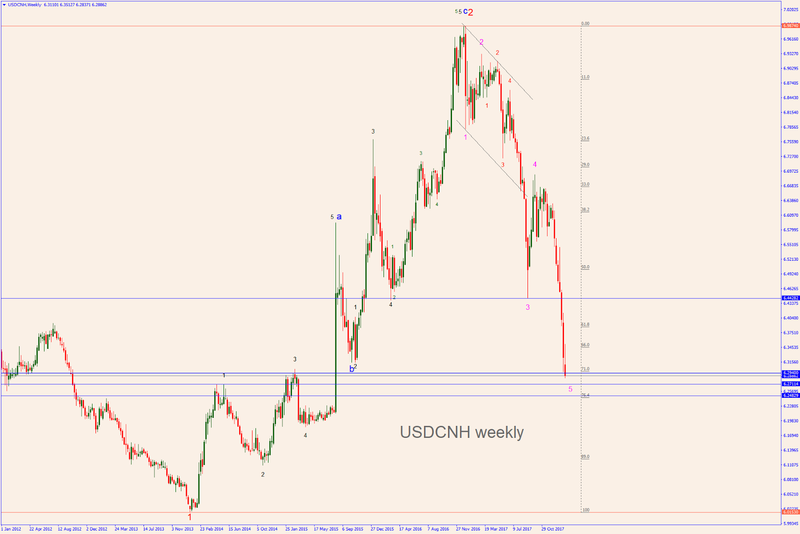 It could end in the 69.6-70.50 area or even the 74-77 area. As in the daily chart, another smaller wave-four is unfolding with an a-b-c where wave-a is already in place and wave-b is topping soon. 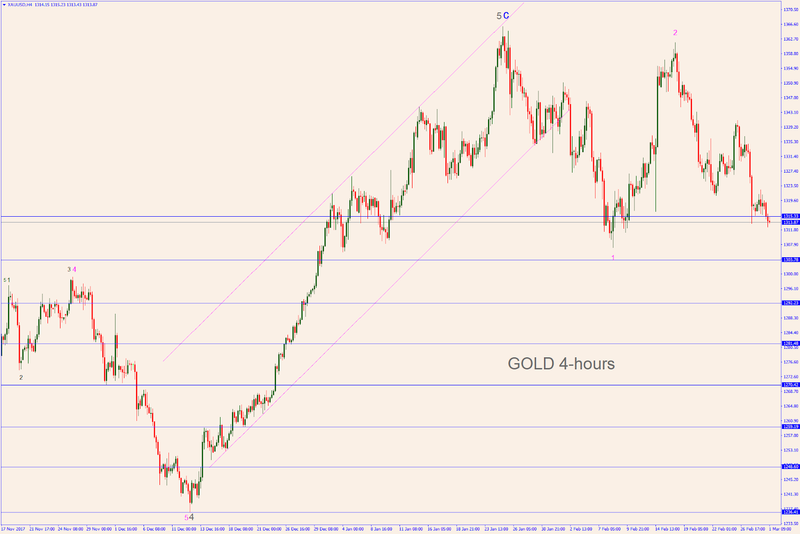 This demonstrates that this is only a temporary retracement. 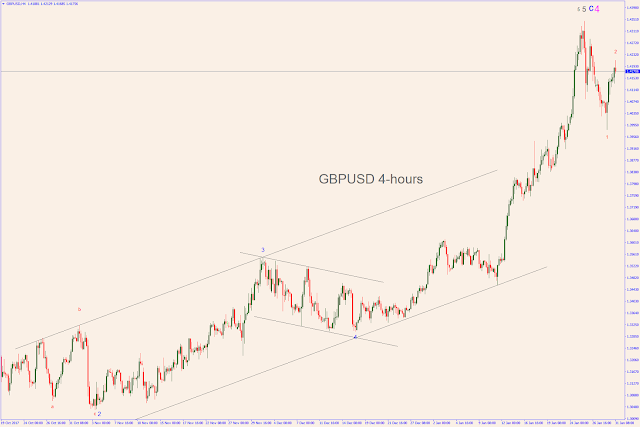 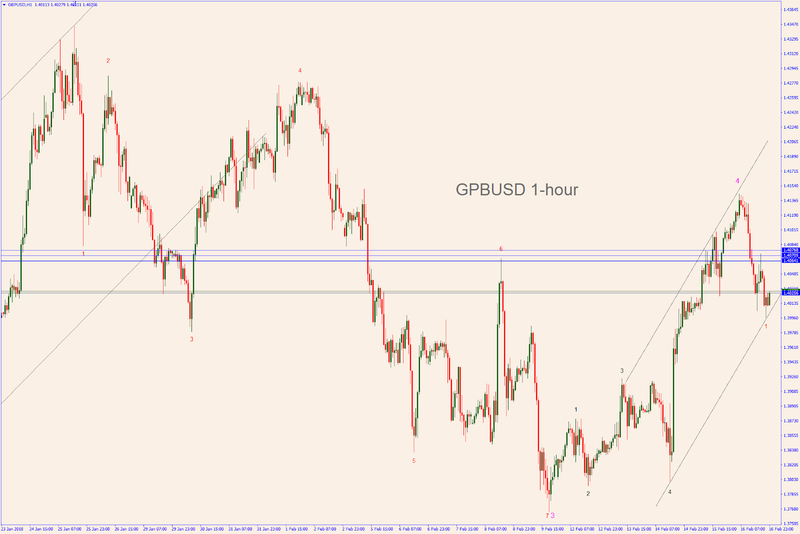 The 4-hours chart and the 1-hour chart draw our attention to the incoming target at 64.75-65.05. 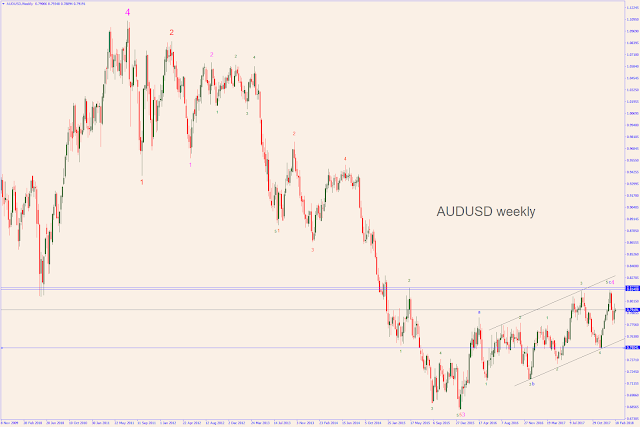 Although another small rally to 0.795 is still possible, the AUDUSD (now at 0.7920) should resume the major downtrend to 0.75 soon. The monthly chart reveals that the Aussie is unfolding a huge a-b-c retracement wave (since July 2011) where the last leg (wave-c) is supposed to be made out of 5 large waves down. 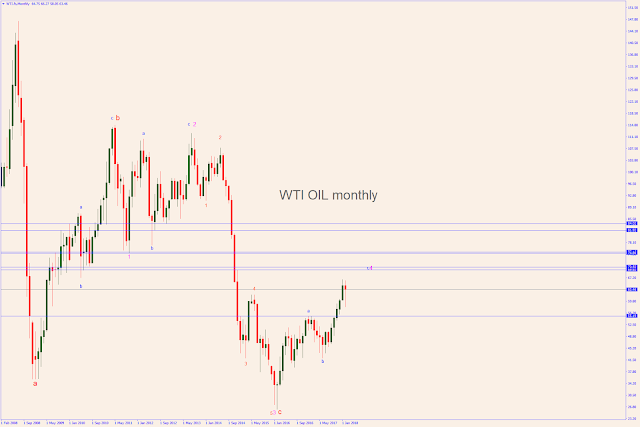 Four of these five waves can be observed in their entirety on the monthly and weekly charts. 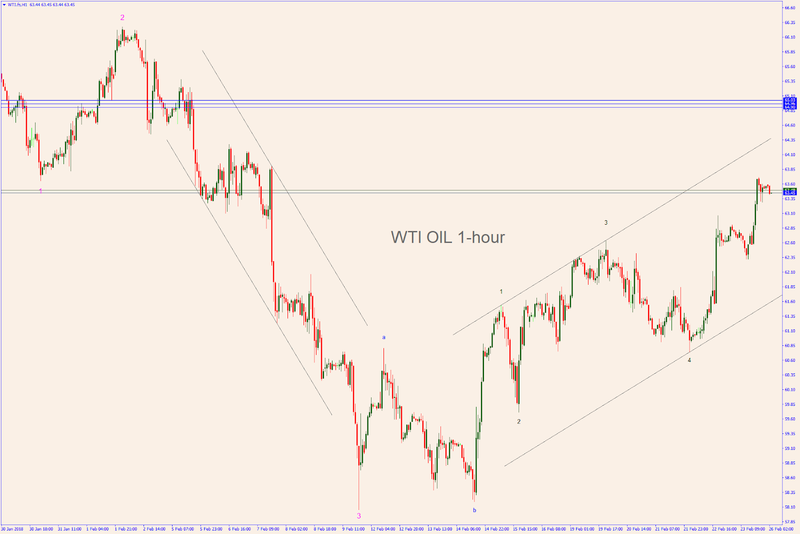 With the top on Jan 26, their deployment is now complete. 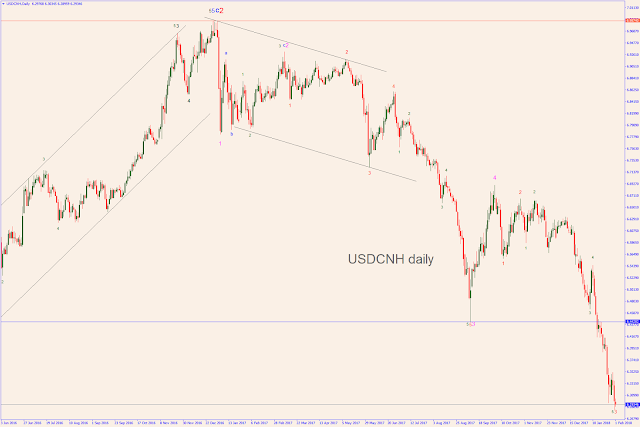 This means that the formation of the fifth wave down begun on Jan 26, as you can see in the daily and 4-hours charts. 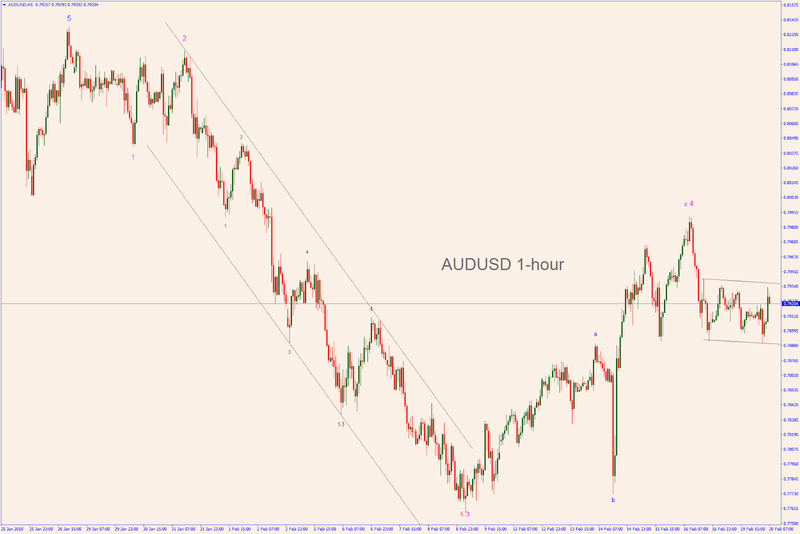 For the time being, this new phase should take the Aussie down to the 0.75 area. 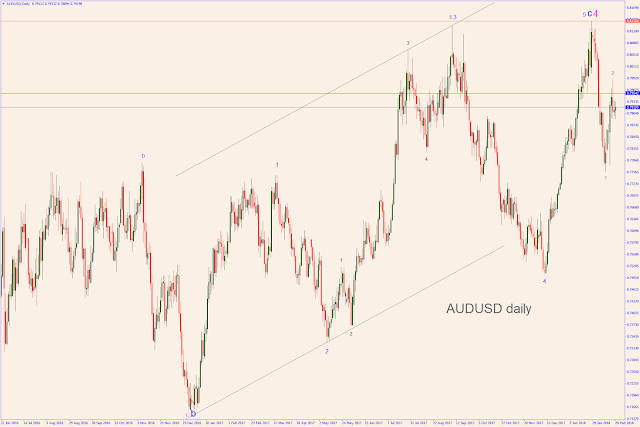 Subsequently, unless a "surprise extension" to 0.85 occurs, the Australian Dollar should take a dive well below 0.75. 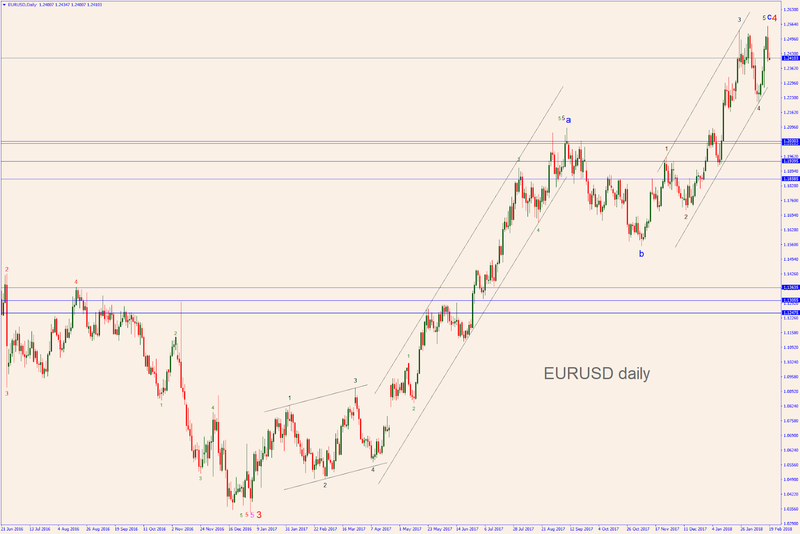 The EURUSD (now at 1.2412) apparently topped at 1.2555, although I thought it would have ended its run a bit higher. 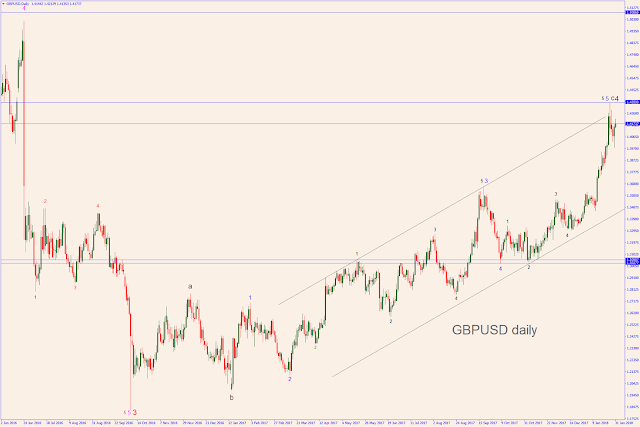 It's now supposed get back to 1.244-1.246 and then resume the downturn to the 1.20-1.18 area and below. 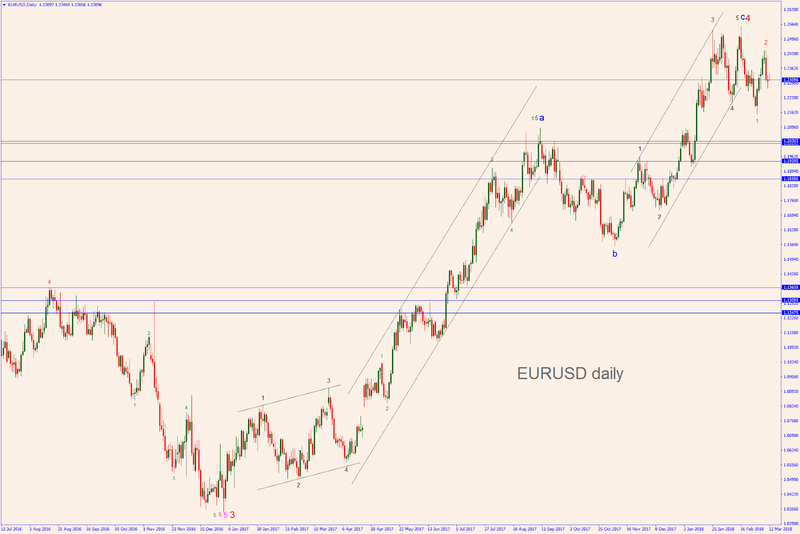 For the time being, this new phase should take the Euro down to the 1.20-1.18 area. 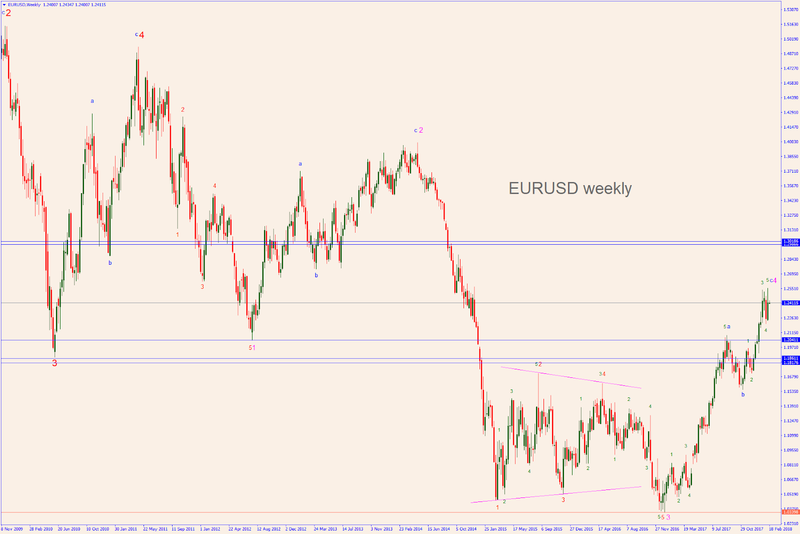 Subsequently, unless a "surprise extension" to 1.30 occurs, the Euro should take a dive well below 1.18. 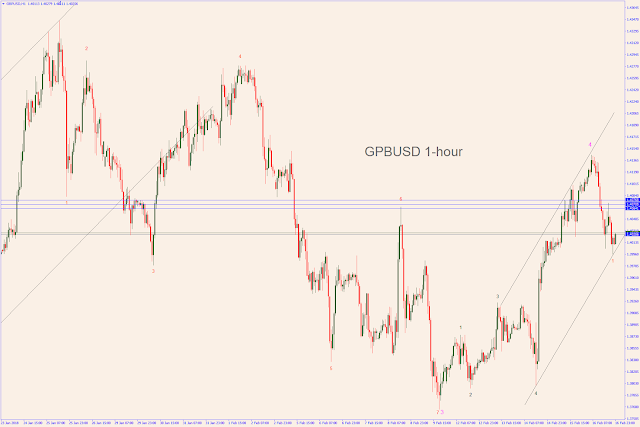 The Pound (now at 1.4025) dived as predicted in my previous newsletter. 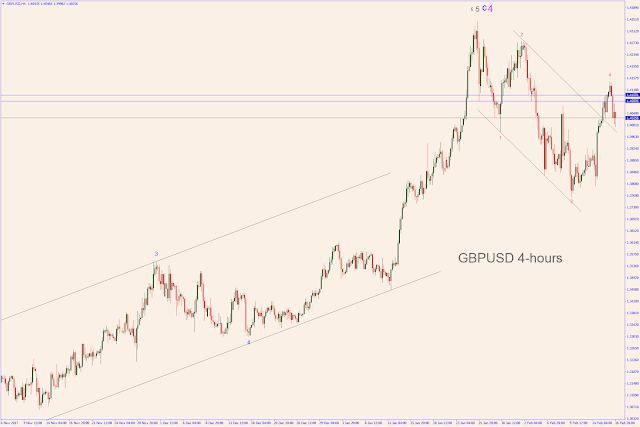 Unless a surprises rally to 1.45 occurs, it is now supposed to bounce back to 1.41 before resuming the major downtrend. 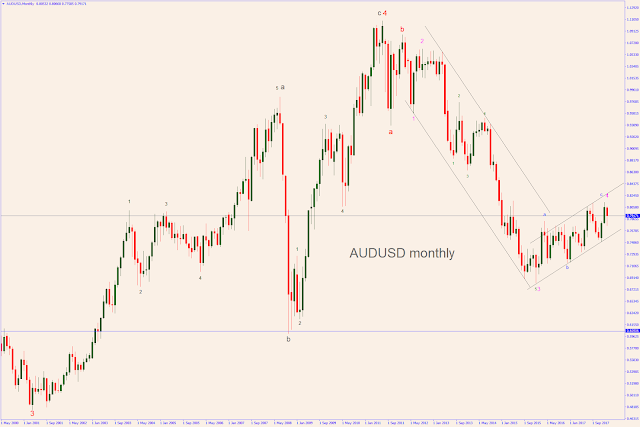 The monthly chart reveals that the Cable is performing a huge a-b-c where wave-c is made of 5 waves down. Four of these waves are already fully deployed. 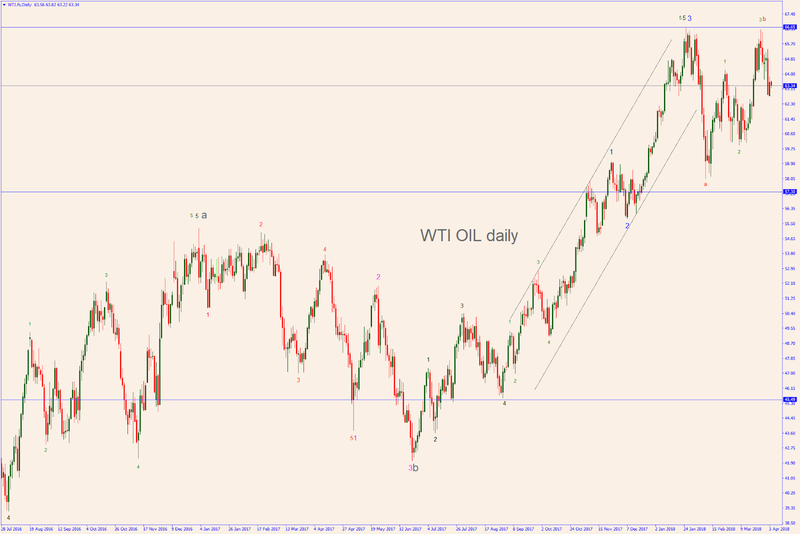 The making of the fifth wave has just started. 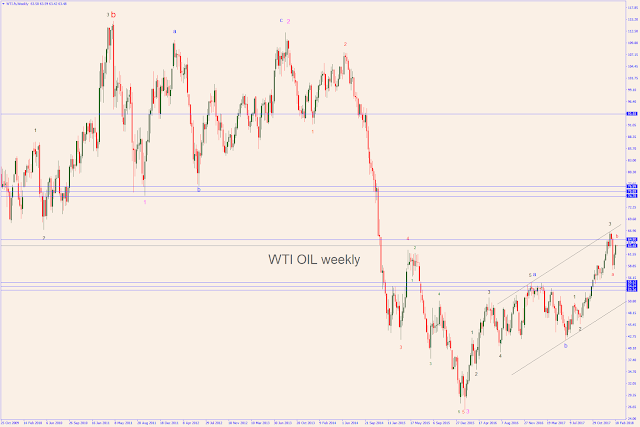 The weekly chart displays the end of major-wave-4 but it also shows that the theoretical target is 1.45. 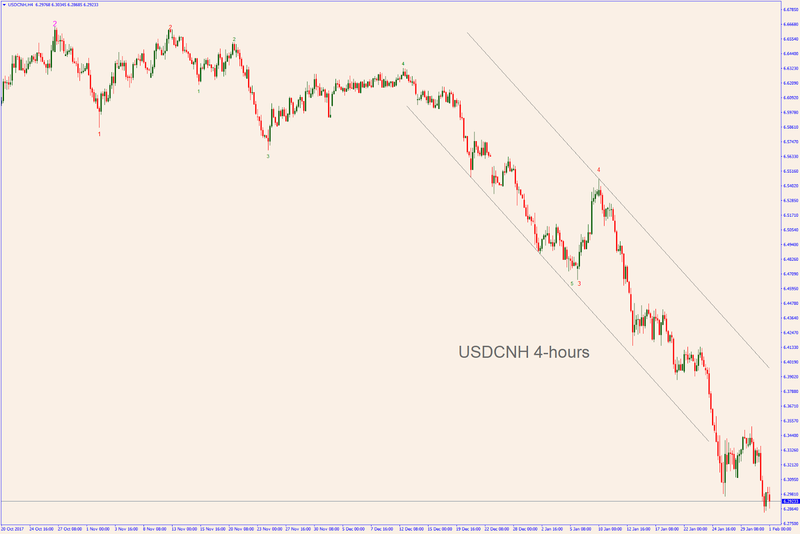 This is one of the two reasons why I said that a last minute "surprise rally" is still possible. 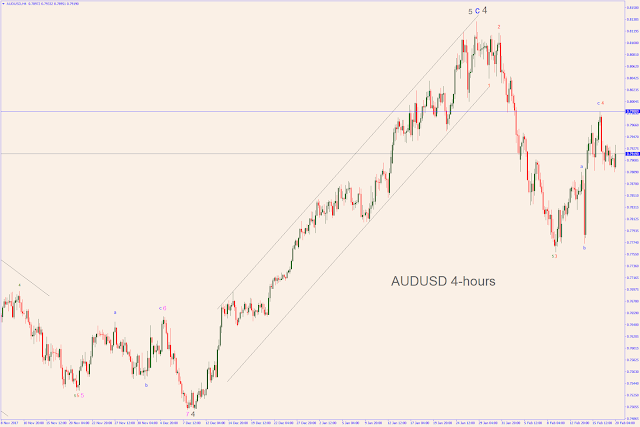 The second reason is that the wave count actually allows it. 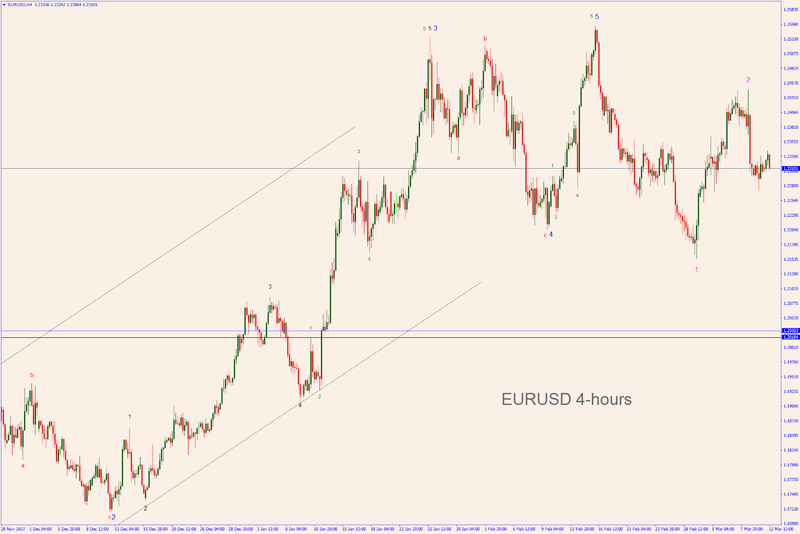 The daily and the 4-hours charts display four small waves down from the top at 1.4350. 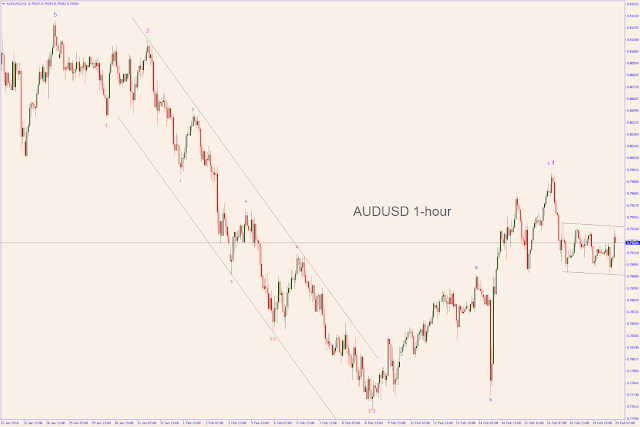 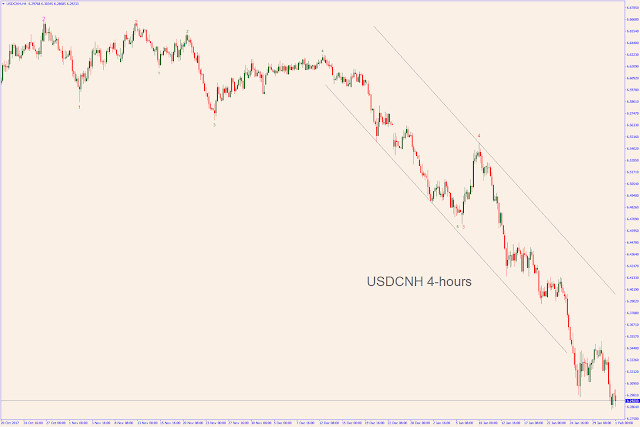 The 4-hours and the 1-hour charts suggest a limited rebound to 1.407-1.410 before resuming the downtrend. Although I originally expected the Pound (now at 1.42) to top around 1.45, it might not be able to make it. 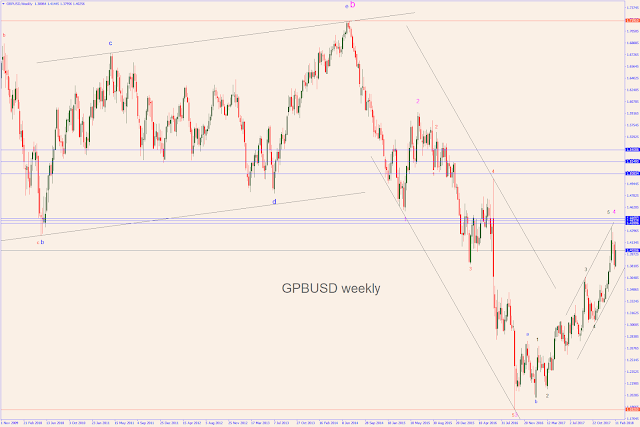 Even if the GBPUSD attempts another rally to 1.45, it should be the last one and the start of a major downtrend might be in sight. Consequently, the top we have seen at 1.4345 might be the very end of the rally started on Oct 2016 at 1.1825. The monthly and the weekly charts display the end of major wave 4. They also show the theoretical target at 1.45. 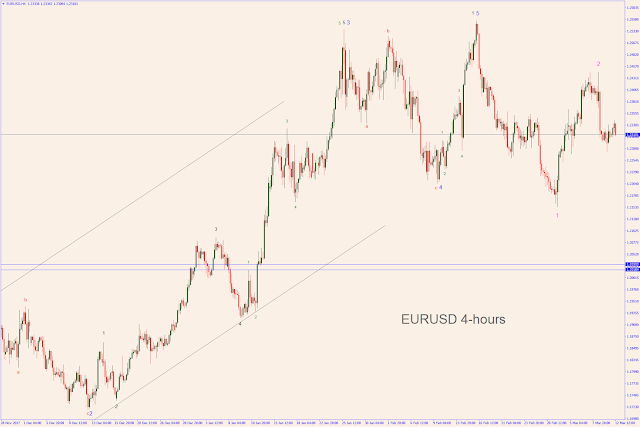 The daily and 4-hours charts display the last wave count.